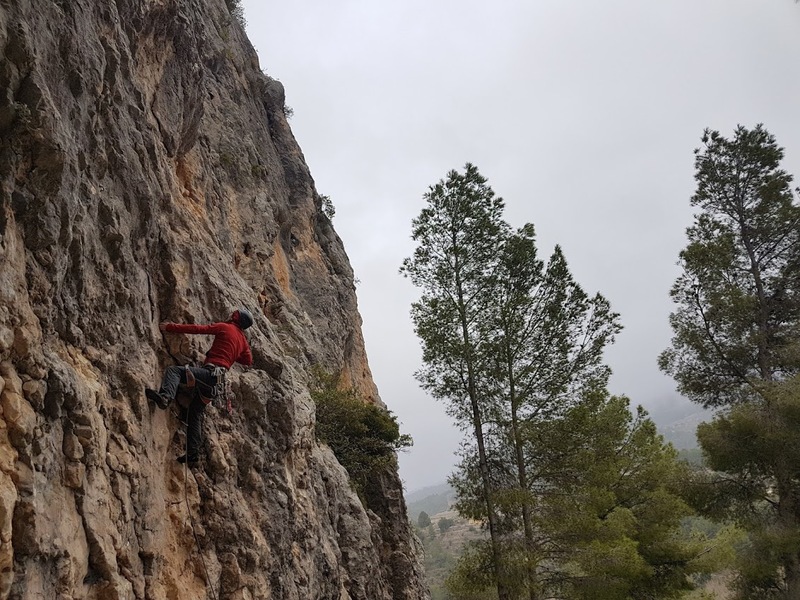 Today’s blog will be written by another guest climber, this time Gerard, who definetly was the top performer in todays adventure. Me looking at a bolt. And over to me……. I’d had an enforced rest day on Saturday as I’d twisted my ankle on Friday night, so – while the others battled seagulls and polished limestone on the Penon d’Ifach – had been left at our hostel in Finestrat, clasping a packet of frozen vegetables(an improvised icepack) to my foot. That left me hungry to get back on rock but unsure about how much I could afford to challenge my ankle. Luckily the group vote was for a venue with a short walk-in: the crags clustered around (and under) the hilltop town of Guadalest. Guadalest is well worth a visit – even for the non-climbers amongst you. It was once a Moorish citadel (the “al-” in the name betrays its Islamic origins) and some of the fortifications still remain. 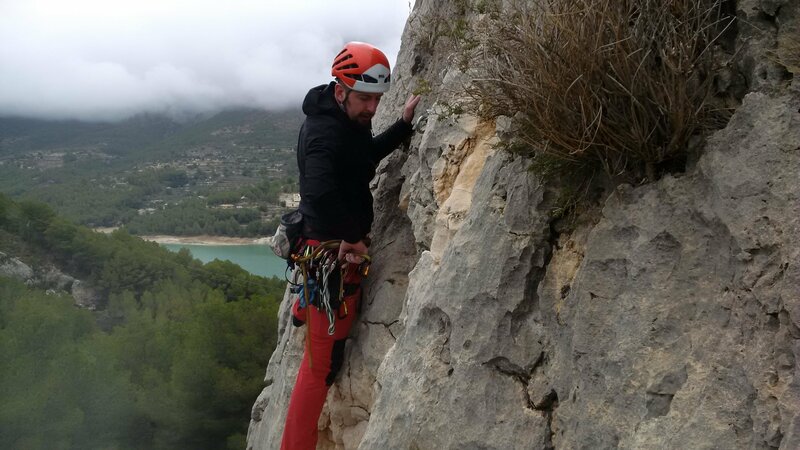 We started the day in the Penya l’Alcala area (the rock wall to the right of the above photo) which contains a range of routes up to 70m in length. Unfortunately the day started in cloud and the drizzle came on as we finished our warm up pitches. 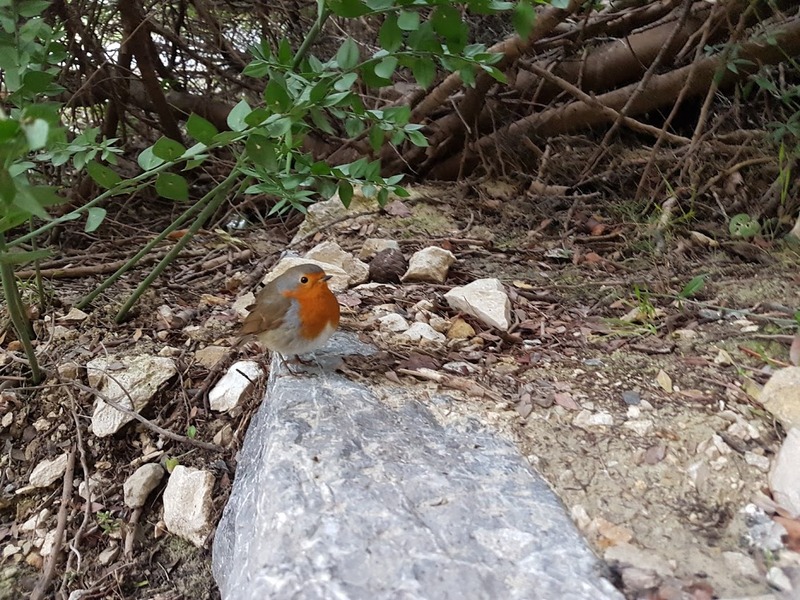 We held out for longer than the Spanish climbers but by 11am abandoned the crag to the inquisitive robin and legged it 100m downhill to the local refugio for hot drinks and buns. The drizzle eventually cleared and we moved on – this time to a smaller crag, Penya Maura, across the road for the refuge. It diverted us for the rest of the day with solid sharp rock and a number of interesting lines. Today didn’t have the sunshine and blue skies we had enjoyed Thursday and Friday but at least the cool air resulted in better friction. We were lucky – our frends in Sella (10 km away) got only one route in before the rain hit there while in Guadelest the rain was never more than weak and intermittent. My ankle held out and my enforced rest meant I was ready for it – my highlights being the the overhanging jugfest that was Jana (luckily I’d been tackling overhangs at the wall all winter) and the varied delights of Garrofer (bridging chimneys followed by a delicate precise finish, both 2 star 6a+ routes. Sadly tomorrow is our last full day here — what will it bring?